TRI ANGGONO SULISTIONO, 2201407056 THE EFFECTIVENESS OF USING SUGGESTOPEDIA IN TEACHING SPEAKING (AN ACTION RESEARCH AT GRADE X OF SMA NEGERI 1 KAYEN IN. 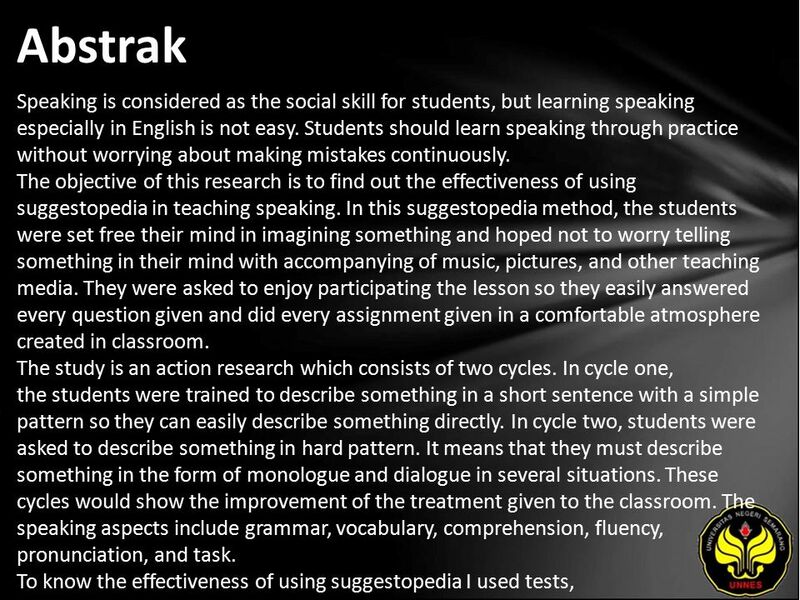 4 Abstrak Speaking is considered as the social skill for students, but learning speaking especially in English is not easy. Students should learn speaking through practice without worrying about making mistakes continuously. The objective of this research is to find out the effectiveness of using suggestopedia in teaching speaking. In this suggestopedia method, the students were set free their mind in imagining something and hoped not to worry telling something in their mind with accompanying of music, pictures, and other teaching media. They were asked to enjoy participating the lesson so they easily answered every question given and did every assignment given in a comfortable atmosphere created in classroom. The study is an action research which consists of two cycles. In cycle one, the students were trained to describe something in a short sentence with a simple pattern so they can easily describe something directly. In cycle two, students were asked to describe something in hard pattern. It means that they must describe something in the form of monologue and dialogue in several situations. These cycles would show the improvement of the treatment given to the classroom. The speaking aspects include grammar, vocabulary, comprehension, fluency, pronunciation, and task. To know the effectiveness of using suggestopedia I used tests, questionnaire and doing observation as the instruments. At first, the means of the pre-test is 38.84. Then, the first cycle test means score is 59.73. While the posttest means score is 74.00. Whereas from the questionnaire, it shows that the students were interested in this teaching method. They felt comfortable in attending this classroom and understood the material given easily by the activities. Moreover, based on the observation during the research, the students enjoyed the suggestopedia classroom because they are asked to do some fun activities. Based on the result of the computation I can conclude that suggestopedia is effective to improve students’ speaking skill. As a result, students were interested in this method because they can practice English in different way. The English teacher is expected to be creative in initiating the new ideas to teach speaking English. 6 Referensi Anderson, M and K. Anderson.1997. Research and Education. New Jersey. Practice Hall, Inc. Arikunto, Suharsimi. 1998. Prosedur Penelitian. Jakarta: PT. Rineka Cipta. Arikunto, S. 2006. Prosedur Penelitian Suatu Pendekatan Praktik. Jakarta: Rineka Cipta Bailey, K.M.2005. Practical Language Teaching. Speaking. Singapore. Mc Graw Hill Bailey, K.M. and L.Savage. 1994. 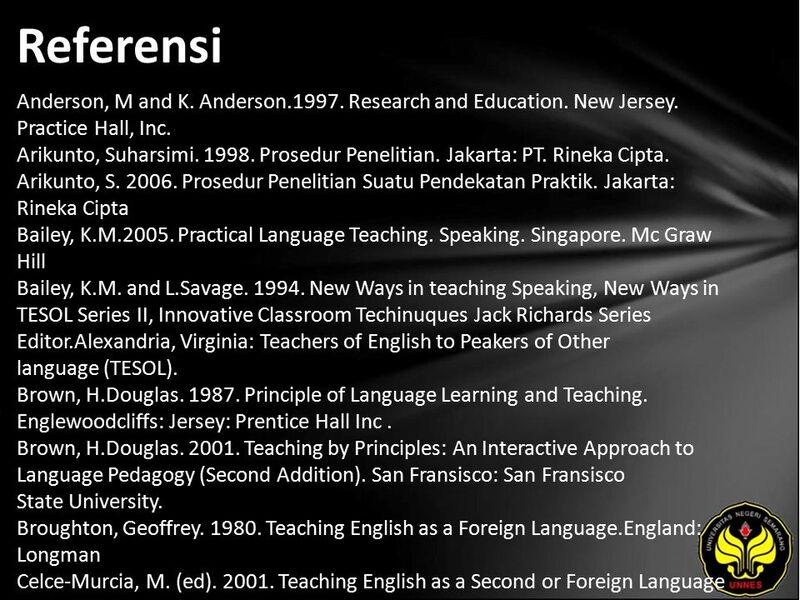 New Ways in teaching Speaking, New Ways in TESOL Series II, Innovative Classroom Techinuques Jack Richards Series Editor.Alexandria, Virginia: Teachers of English to Peakers of Other language (TESOL). Brown, H.Douglas. 1987. Principle of Language Learning and Teaching. Englewoodcliffs: Jersey: Prentice Hall Inc. Brown, H.Douglas. 2001. Teaching by Principles: An Interactive Approach to Language Pedagogy (Second Addition). San Fransisco: San Fransisco State University. Broughton, Geoffrey. 1980. Teaching English as a Foreign Language.England: Longman Celce-Murcia, M. (ed). 2001. Teaching English as a Second or Foreign Language Third Editor. US: Heinle and Heinle, a division of Thomson Learning. Crystal, D and D. Derek. 1975. Advanced Conversation English. England: Longman. Departemen Pendidikan Nasional. 2006. Kurikulum Tingkat Satuan Pendidkan Sekolah Menengah Pertama. Jakarta : Depdiknas. Ellis, R. 1997. Second Language Acquisition. Oxford: Oxford University Press. Freeman, Larsen. D. 1986. Techniques and Principle in Language Teaching. England: Oxford University Press, Inc. Gerot, L and P. Wignell.1994. Making Sense of Grammatical. Sydney: Gerd Stabler. Gillett, Amy. 2004. Speak English Like an American. Ann Arbor: Language Success Press. Lozanov, G. 1978. Outlines of Suggestology and Suggestopedy. London: Gordon and Breach. Harmer, J. 2001. The Practice of English Language Teaching. Cambridge: Longman. Hopkins, D. 1985.A teachers guide to classroom research. Philadelpia: Open University Press. Hornby, A. S. 1995. Oxford Advanced Learner’s Dictionary New York: Oxford University Press. Mills, G.E. 2000. Action Research (Action Research Guide for the Teacher Researcher).New Jersey: Practice Hall Inc. Mujiyanto, Y. 2009. Petunjuk Penulisan Skripsi. Semarang: English Department Nunan, D. 1989. Designing Task for Communicative Classroom. Cambridge: University press. Ramelan. 2003. English Phonetics (4th Ed.). Semarang: UPT UNNES Press. Richard, Jack.C. 1986. Approaches and Method in Language Teaching A description and Analysis. Cambidge: Camridge Press Tri Anni, C. et al. 2004. Psikologi Belajar. Semarang: UPT MKK UNNES. Download ppt "TRI ANGGONO SULISTIONO, 2201407056 THE EFFECTIVENESS OF USING SUGGESTOPEDIA IN TEACHING SPEAKING (AN ACTION RESEARCH AT GRADE X OF SMA NEGERI 1 KAYEN IN." SITI MUTHOHAROH, THE USE OF SMALL GROUP DISCUSSION IN TEACHING WRITING (NARRATIVE TEXTS) TO SENIOR HIGH SCHOOL STUDENTS OF SMA WALISONGO PECANGAAN. EKO AJI PRASETYO, TEACHING ENGLISH USING HIGH TOWN CARD GAME TO ENHANCE STUDENTS SPEAKING ABILITY (ACTION RESEARCH AT SEVENTH GRADE STUDENTS. 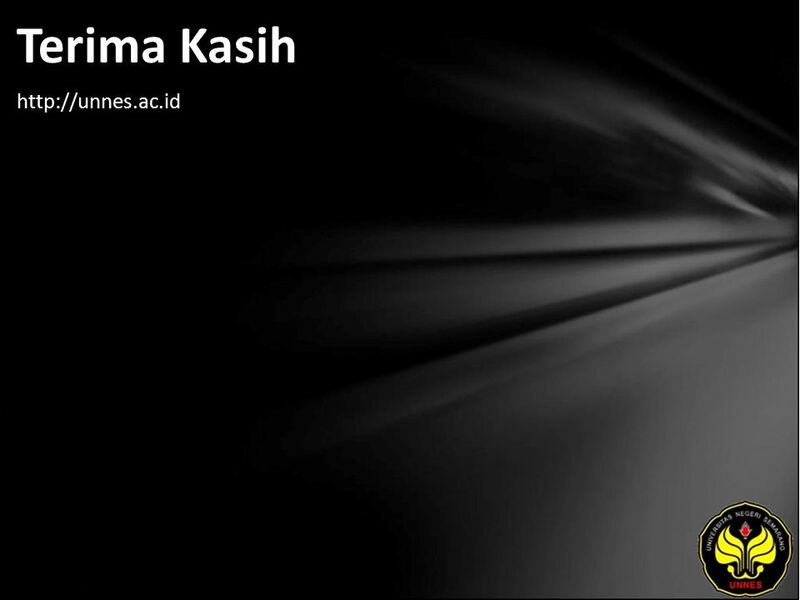 RAHMA MUSTIKARINI, THE USE OF ILLUSTRATED FOLKTALE THE CARELESS JAKA TARUB TO IMPROVE THE STUDENTS ABILITY IN UNDERSTANDING NARRATIVE READING. ARTIN FERIANA ARJATI, AN ERROR ANALYSIS ON THE USE OF GERUND AMONG THE FOURTH SEMESTER STUDENTS OF THE ENGLISH DEPARTMENT OF UNNES IN THE ACADEMIC. DIYAH LISTIYANI, AN ANALYSIS ON WRITING EXERCISES OF JUNIOR HIGH SCHOOL BOOK COMMUNICATIVE INTERACTIVE ENGLISH FOR THE YEAR VIII OF JUNIOR HIGH. DIMAR SITI MUNTHAROH, EXPLORING STUDENTS IDEAS IN WRITING HORTATORY EXPOSITION TEXT THROUGH ONE STAY THREE STRAY STRATEGY (AN EXPERIMENTAL RESEARCH. WIDYA RATNA KUSUMANINGRUM, THE USE OF PREVIEW, QUESTION, READ, SELF-RECITE, TEST (PQRST) TECHNIQUE IN TEACHING READING COMPREHENSION OF NEWS. SHAHNAZ REZA PAHLEVI, AN ANALYSIS OF STUDENTS DIFFICULTIES IN MASTERING VERB PREPOSITION COMBINATIONS (Case Study of the Senior Students of. ERIKA SEPTIANINGRUM, A Descriptive Study on The Students' Mastery Of Conjunctions:But, And, Or, Before, After. PRANITA NURMALINA, TEACHING WRITING PROCEDURE TEXT USING REAL THINGS (An Action Research Conducted at SMP Negeri 1 Randudongkal in the Academic. ASTI KURNIANINGSIH, WRITING DIARY AS AN ALTERNATIVE TECHNIQUE IN TEACHING WRITTEN RECOUNT TEXT ( The Case of Teaching Writing Recount in SMP. HARUM SUSANTI, ELEMENTARY SCHOOL STUDENTS IMPROVING WRITING SKILL IN DESCRIPTIVE TEXT USING MINIATURES AS THE MEDIA. FITRIA DEWI, THREE STAY ONE STRAY STRUCTURE AS A METHOD FOR TEACHING SPEAKING AT SENIOR HIGH SCHOOL (A CASE OF THE ELEVENTH GRADE OF SMA NEGERI. HERLITA SUSANTI, IMPROVING STUDENTS SPEAKING SKILLS USING INTERACTIVE ACTIVITIES IN TEACHING LEARNING PROCESS. AGNES ARUM BUDIANA, THE USE OF LOOK AND SAY AS A TECHNIQUE IN TEACHING READING TO ELEMENTARY SCHOOL STUDENTS. MOHAMMAD HAMBALI, THE APPLIACTION OF COLLABORATIVE WRITING FOR TEACHING WRITING NARRATIVE TEXT (A Classroom Action Research of the Eighth Grade. HUSNI SUBHAN, OUTDOOR CLASSICAL MUSIC AS AN ALTERNATIVE MEDIA FOR TEACHING STUDENTS IN WRITING DESCRIPTIVE TEXT (A CASE OF THE SECOND YEAR STUDENTS. WISNU AJI DHARMA, ERROR ANALYSIS ON THE USE OF NOUN PHRASES A Case of Year Eight Students of MTs Assaid Blado, Batang in the Academic Year of. 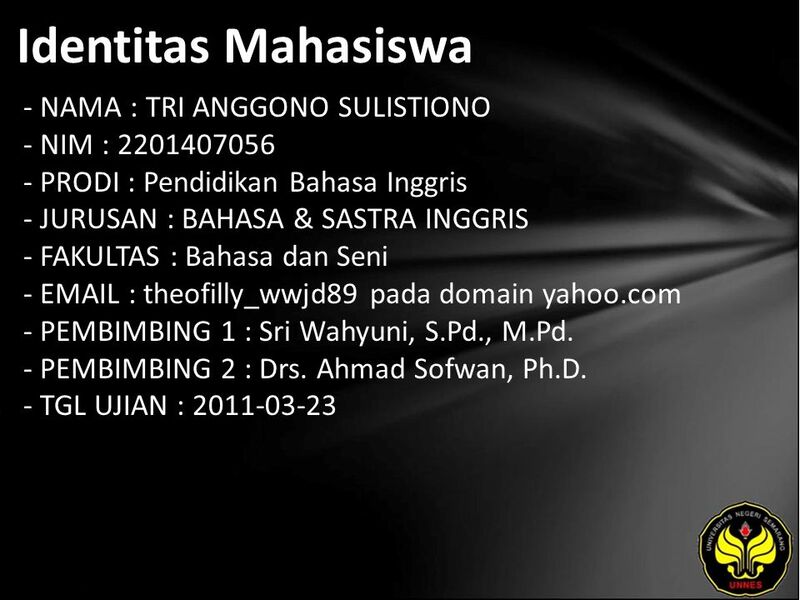 ULIN NAFIS, THE ANALYSIS OF ENGLISH UAN 2007 OF SMA IN THE ACADEMIC YEAR 2006/2007 BASED ON COGNITIVE BLOOMS TAXONOMY. RATNA INDRIANI, 2201405600 PETER PAN FILM AS A MEDIA TO IMPROVE THE STUDENTS ABILITY IN WRITING NARRATIVE TEXTS (An Action Research at the Year Eleven.